We should have known. Petrea and I read about this place at the Pasadena History Museum. Blast! A cure for Swell Head? This post is filled with wonderful stuff. 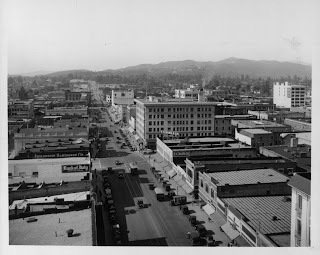 We had a Nash's Department Store in Pomona when I was a wee bairn. Are you sure my answer about the 1st blogger gathering wasn't correct, PIO?? Oh, well, I gotta spend more time in a museum! I'm the guy on the left. Darn! 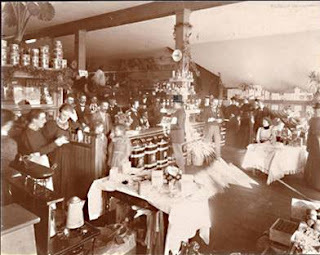 I was so close - I found pictures of both Blue Front Grocery and Nash's last night, and decided the people in the Nash's photo looked too modern. Now I see it was a 1900 photo. It's good when you beat us now and again, Ann, a little reward for all your hard work with these quizzes. The photos of Colorado Street are new to me - I see no traffic lights or trees, and lots of parking for cars. I moved to Pasadena in 1975 and remember walking by the burned-out Nash's in 1976 and seeing burned mannikins in the front window. Never went into the store. That sounds pretty creepy, Kevin. A segment of the Twilight Zone. 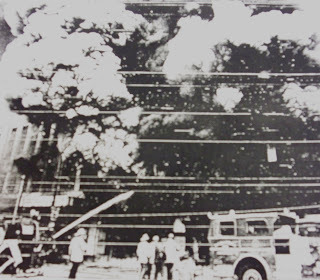 I remember that fire---more to the point, I remember the sound off happening in SoPas when it happened. And then the tittering of my grandmother and ALL her friends, plus my godmother and her friends that Nash's had burned. The story about someone being trapped inside continued as fodder until my grandmother and her friends died. Everyone was sure someone died and it was covered up for some reason. Up until about 15 years ago, my grandmother still had a box with their logo on it in her basement. If I recall correctly, this fire led to the mall being built later? Trish, the fire did not lead to the first mall being built, but it certainly made it easier. The area had already been slated for redevelopment. One reason the Nashes founded Christmas Tree Lane is because they LIVED IN ALTADENA! 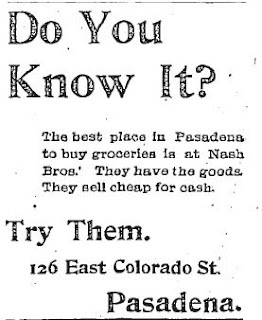 I'd be interested to know if they ever lived in Pasadena, and then moved here, but at the time he established CTL in 1920, Fred Nash lived on Lincoln Ave. Perhaps he was the son of the department store founder. Because many people of note were active in Pasadena, it is often assumed they lived there. Michele, A.K. and J.D. lived in Pasadena. Yes, Fred lived in Altadena! I should have mentioned that. I presume he was the son of one of the brothers but I haven't been able to cite that officially yet. I may have time next week to do some more digging. Michele, I now have it on the best authority that Fred C. Nash was the son of A.K. Nash and the nephew of J.D. Nash. Fred was AK's son - or grandson. And he's my great-great grandpa. Nice to see these photos up and hear the old Pasadena gossip! 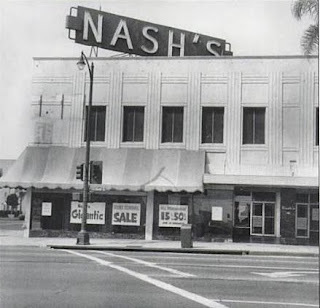 The Nash familly supported the arts and artists in the 1960's in Pasadena. One such arist from N.Y. painted portraits of myself and some of my friends.I am trying to find out what became of those paintings. Thank you for sharing your experience and success. I hope that everyone who will read your entry will pursue their work also. Likewise to the Latino Business they have to be included on the ranking of paginas amarilla so that their business will be successful and more services they need to provide. I am living in the home build and lived in by Carl Enos Nash who I believe is the son of Frederick C. Nash. He built it in 1904 on what is now Oakland Avenue in Pasadena. Does anyone have any memories or information on Carl Enos or the home? 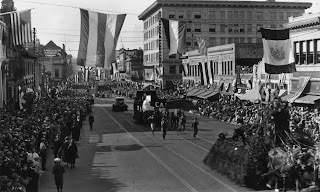 I am the grandson of Earl(e) Nash and remember watching the parade from the store on Colorado. Great historical info that my family will enjoy. We live in Pasadena in a house we bought in 2001 and the real estate literature said it was built by the founder of Nash's Department Store for his "spinster" sister. It was built in 1923 and is near the intersection of Los Robles and Glenarm. Anyone know anymore about the house's history? 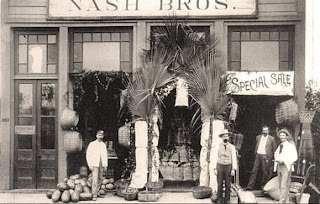 I remember the Nash's store in Pomona (later became a Boston Store) my mom shopped there frequently. Once when she was cleaning out my granparents house after the both died (in Kansas) There was a gift box from there with the design of all the Pasadena Landmarks such as the Colorado Bl Bridge, when my folks both passed away I dunno what happened to that box but does anyone know if they are valued as a collectible? Donna Machado, not sure why your name is so familiar to me. I'm sure we've corresponded about Pasadena somewhere along the way. I have a 1909 news magazine on the Tournament and in an article on bungalows, there's a photograph of the Carl Enos Nash home on Galena Avenue. Happy to share it if you're interested. Already scanned. Thanks for the post about this. I just found an old Nash's box. It has the logo and "since 1889", as well as a few drawings, including the Rose Bowl, San Gabriel Mission, and Huntington Gardens. I grew up in a suburb nearby, but was about 9 when the fire happened, and I never went there.